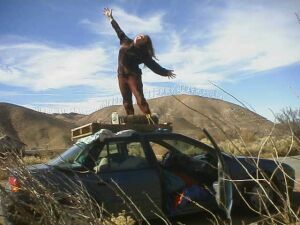 The drive from San Francisco to Death Valley is long as all hell, especially if you start the 12-hour drive at 11:30pm. 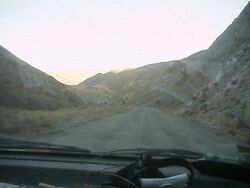 We reached the Valley of Death at sunset the next day. Here's where we slept the first night, when we pulled over at 6am so tired both of us were in pain. We parked under the amazing array of power-generating windmills on top of the hill behind Red. In the breezy morning we could hear the power lines crackling. After all that driving and sleeping and windmill chasing we made the final turn from the highway to begin the 50 miles of dirt roads that were the final approach, and we were greeted by a vague "Road Closed" sign in the middle of the road, laughing at us for not researching road conditions. We did the only logical thing: we drove around it without even slowing down. "Did you see something?" "No, I didn't see anything." 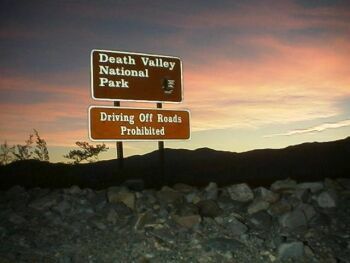 So we kept an extra eye on the road for any exotic Death Valley obstacles that might come our way. But horah horah, none did. you didn't stop to get a picture of the sign you flagrantly violated? shame on you. sure that wasn't just yer neurons crackling? Back when my art car sported tags from the state of misery, more than once I've gotten by with a warning instead of a ticket for being in an area beyond such signs as ROAD CLOSED or NO VEHICLES BEYOND THIS POINT due to miserys little ditty "the show me state". Various LEOs have asked me to accompany them to the sign I missed, they point to it and say, "There, I've showed you." To which I reply, Ohhh, how could I have missed that? Then I'm told not to let it happen again, and off they go. Strange universe. 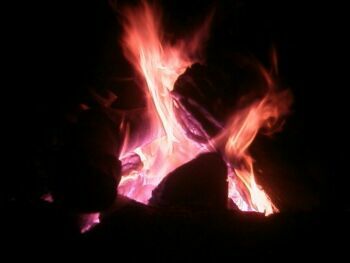 We pulled into camp, which for this year's Thanksgiving festivities consisted of about 20 souls including the two turkeys, and we sat by the fire and I opened a bottle of gin and performed a little experiment on myself to determine if gin drinkers are in fact the worst drunks. "Gin, makes a man mean"
"So drink up and riot"
So are they? And who are the best drunks? Do they get awards? but did he break a bottle over anybody's head? its ok no that interesting.it didnt seem to have much details.get a life. i think that Dr. King was a speical man that had a dream to set the black people free and he did by the speechs that he made to set them free.He was a loved man by all that loved his speechs and the ones that he died for to make the U.S a fair country to all living things on the face of the earth.He died like i said he did because he did what he thought was right. I was at least making a most loquacious drunk, and in the distance the 730-foot Eureka sand dunes loomed in the moonlight. So when people around the fire started snoring (probably my fault), we figured it was time to mount our assault. We'd never seen the dunes by day, they were just a few massive moonlit white hulks in the distance. So we started the trudge with the moon lighting our way reflecting brightly off the white sand. The sand is fine and clean as white pepper, and after you rub it over yourself there's no residue at all, no dust or dirt or anything. And the wind has whipped this fine light sand into a series of steep faces cresting in a network of knife-edge ridges, with almost no flats at all. So we were trudging and trudging for hours, and when I threw the water bottle to Red my aim was a little off, and we listened to the gallon jug slide down the dune into the dark oblivion, never hearing it stop. Oh well, water in the desert is overrated. After reaching what must have been the fifth false summit we found a nice flat spot which would have been a perfect home except that there were already a few tents there. 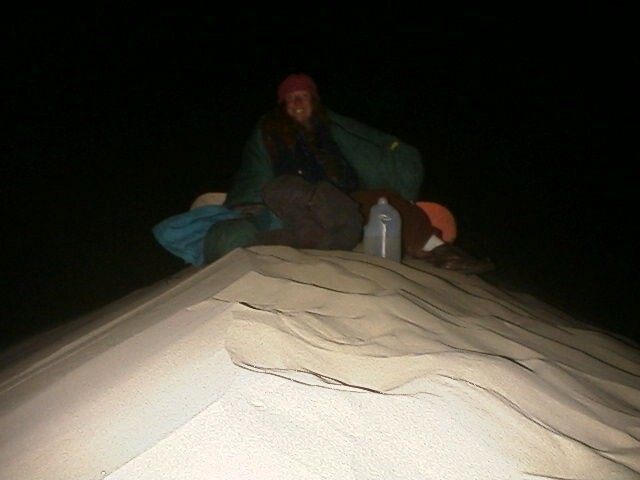 We did the only thing we could after walking up a monstrous sand dune by moonlight and happening upon an encampment: we harassed them. 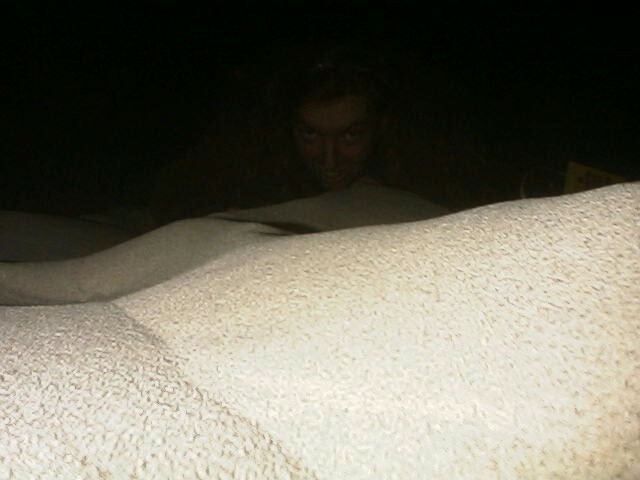 We banged on the sand and made animal noises until someone in one of the tents asked "Are we being fucked with?" And when we responded with a few moos and baaaas he said conclusively, "Yes, we're being fucked with." 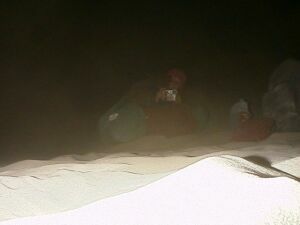 He came out and shooed us away like we were a couple of raccoons, paying no attention to the fact that we were clearly cows at that point, and we made our daring escape by sliding down the midnight sanddune, then continued the trudge I mean climb. 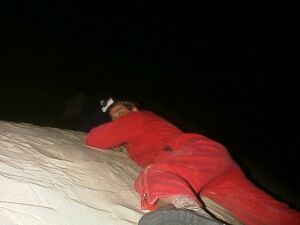 red flannel long-johns in the dessert? when we were kids and our parents would take us to death valley for weeks at a time, they always told us that the dunes at night were rife with rattle snakes....i think they were lying. Oops... leave no trace, people. Don't throw it if you don't know it. That "jumpsuit" looks like it could jump by itself, alright. I have a bruise on my back from where the waterjub hit me before it went careening down into oblivion. Being on a mountain of sand in a dry desert at high altitude with no eater is extrememly refreshing. I'll bet is was awful cold on all that snow! The sun shown so hard I froze to death. You bastards! Shame! Giving us the Blair Witch treatment like that!